Bioinformatic data sources available on the web are multiple and heterogenous. 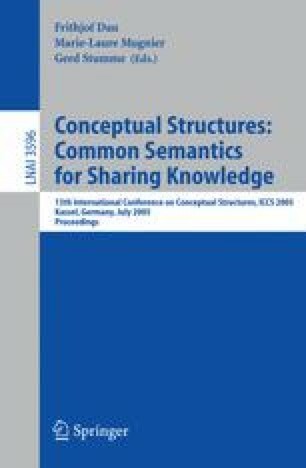 The lack of documentation and the difficulty of interaction with these data banks require users competence in both informatics and biological fields for an optimal use of sources contents that remain rather under exploited. In this paper we present an approach based on formal concept analysis to classify and search relevant bioinformatic data sources for a given user query. It consists in building the concept lattice from the binary relation between bioinformatic data sources and their associated metadata. The concept built from a given user query is then merged into the concept lattice. The result is given by the extraction of the set of sources belonging to the extents of the query concept subsumers in the resulting concept lattice. The sources ranking is given by the concept specificity order in the concept lattice. An improvement of the approach consists in automatic refinement of the query thanks to domain ontologies. Two forms of refinement are possible by generalisation and by specialisation.